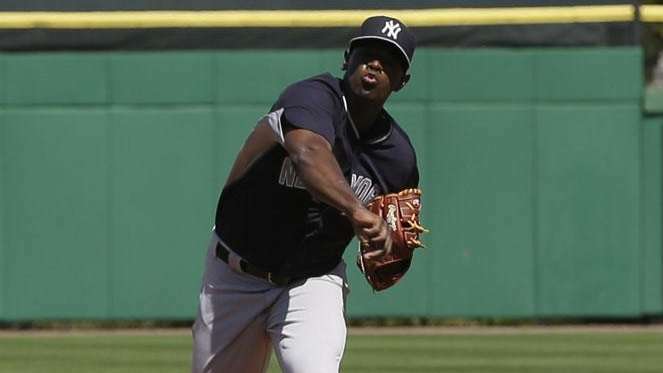 Top Yankees pitching prospect Luis Severino struck out three in five innings, allowing four hits, three walks and two runs in Triple-A Scranton/Wilkes-Barre's 6-4 win over Rochester on Tuesday. Severino (2-0, 2.91 ERA) threw 59 of his 103 pitches for strikes. The righthander issued three walks for just the third time in 12 games this season. It was the second time he's done that in his four Triple-A starts. Severino walked two batters combined in his last two starts (12 1/3 innings). Severino held Rochester scoreless for the first five innings, allowing three singles and two walks. But he gave up a single to James Beresford to lead off the bottom of the sixth and walked Eric Fryer. Righthander Jaron Long, making his first relief appearance since July 2014, replaced Severino and got a ground out and a line out before allowing both inherited runners to score on Reynaldo Rodriguez's single to left. It was the only hit Long gave up in two innings, lowering his ERA to 4.09. The bottom of the lineup backed the efforts of Severino and Long, with the 5-through-9 hitters driving in all six runs. Leftfielder Ramon Flores was 3-for-4 with a home run, and first baseman Rob Segedin and shortstop Gregorio Petit were each 2-for-4 for the RailRiders (38-28, 1st place in International League North). In four Triple-A starts, Severino has struck out 11 and walked eight in 21 2/3 innings, allowing 17 hits and seven runs. First baseman Greg Bird was 2-for-4 with a double and third baseman Eric Jagielo went 1-for-2 with a double, but Trenton fell to Reading, 8-2. Righthander Rookie Davis (4-4, 3.55 ERA) struck out seven in six innings, allowing 10 hits and one run in a 2-1 win over Bradenton. Rightfielder Mark Payton was 1-for-3 with a home run and a walk and catcher Kyle Higashioka went 2-for-4 with a triple. Second baseman Vicente Conde was 3-for-5 with a double and centerfielder Dustin Fowler went 3-for-5 with a stolen base, but the rest of the lineup produced just one hit and Charleston fell to West Virginia, 5-4 in 10 innings. Designated hitter Nelson Gomez was 3-for-5 with a double and a home run, and leftfielder Dario Unda was 3-for-5 with two doubles in a 9-4 win over the DSL Mariners. Lefthander Alexander Figueredo (2-0, 1.88 ERA) struck out six in five innings, allowing six hits, three walks and three runs (one earned). Second baseman Yonauris Rodriguez was 3-for-4, accounting for half of the Yankees' hits in a 7-0 loss to the DSL Brewers.